Silicon Valley's immigration woes could be great news for Canada. The U.S. government is making it more difficult for companies to quickly hire talent from other countries, with a cap on expedited visas for highly skilled workers and a pending plan to overhaul the H-1B visa program. Meanwhile, Canada is testing new, speedier visas. On Monday, the Canadian government started its new program to issue work permits and temporary resident visas in two weeks instead of the usual year. The two-year pilot, part of a Global Skills program first announced last year, will be available to "innovative" companies seeking highly skilled workers. It's the latest attempt by Canada to lure tech business north of the border. It's also experimenting with looser regulations, tax breaks and rebranding. Later this year, Ontario will launch an ad campaign targeting Silicon Valley decision makers and workers. "It is not for us to criticize the administration. It us for us to recognize an opportunity when we see it," said Brad Duguid, Ontario's Minister of Economic Development and Growth. "The current direction of the administration, which appears to look more inward than outward, is in stark contrast to what we believe is the direction we want to go in." 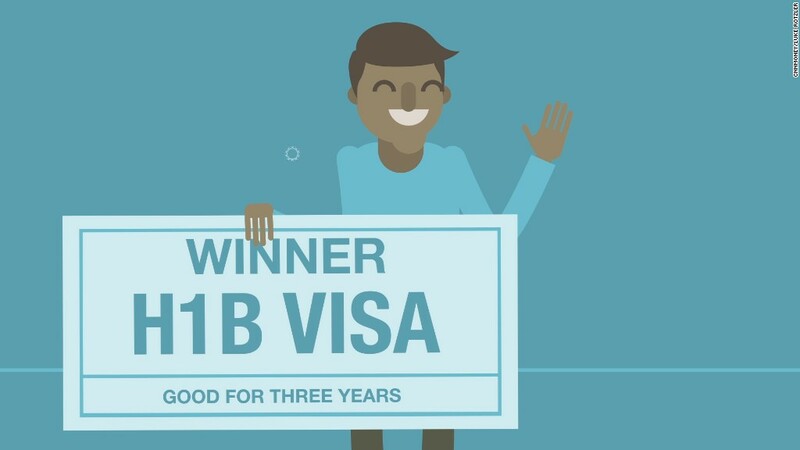 The Trump administration has said it intends to reform the H-1B visa program to weed out abuse. The U.S. tech industry has been vocal in its criticism of Trump's immigration policies, particularly his beleaguered immigration executive order. It's not just a staffing issue. More than half of the billion dollar startups in the U.S. were founded by foreign-born entrepreneurs, according to The National Foundation for American Policy. This is not the first attempt to to attract tech workers to Canadian businesses and cities. Companies like Sortable have run their own ad campaigns to win over U.S.-based workers. A group called True North offers packages for U.S. companies interested in opening a Canadian branch. Home to Blackberry and startups like Shopify, Ontario also hosts satellite offices for major U.S. tech companies like Google (GOOGL), Facebook (FB), IBM (IBM) and Amazon (AMZN). Duguid says it's strong in areas like artificial intelligence, super computing, clean-tech and autonomous vehicles. Canada is not relying on ads and visas alone to appeal to companies. It has a variety of competitive tax credits. Duguid says Ontario has gotten rid of 80,000 "regulatory burdens" so tech companies have more flexibility for research and development, particularly car companies interested in self-driving vehicles. The province has also streamlined the ways it changes regulations so it can accommodate new technology faster. Ford (F) recently said it will invest $1.2 billion for a research and development center in Ottawa. In 2016, General Motors (GM) announced it would increase the number of software engineers it employed in the area to 1,000. The quality of life in Canada might also appeal to workers. Its cities are highly diverse -- over half of Ontario's population was born outside of Canada. The cost of housing, while still high, seems sensible in comparison to current Bay Area prices. There are programs that offer free tuition to low income families and tuition assistance for middle and higher income families. And in addition to universal health care, it has a new universal pharma-care program will offer free medicine for people under 25. "In many ways, we help make life more affordable," said Duguid. "The new government in Canada, the Trudeau government, really gets the importance of streamlining the process of bringing people in." The Trump administration isn't all good news for Canada. Its economy is closely tied to the U.S., which imports $278.1 billion worth of Canadian goods a year, and $29.6 billion in services. A renegotiation of NAFTA, changes to the border adjustment tax, and any Buy American campaigns could negatively impact Canada's economy. For now, Canada is working on taking advantage of the administration's anti-immigration stance. "I don't believe that any jurisdiction has the luxury to discriminate when it comes to attracting talent," said Duguid. "Being good doesn't cut it anymore, you have to be great. To be great you have to attract the best talent in the world." CNN Tech's Sara Ashley O'Brien contributed to this report.